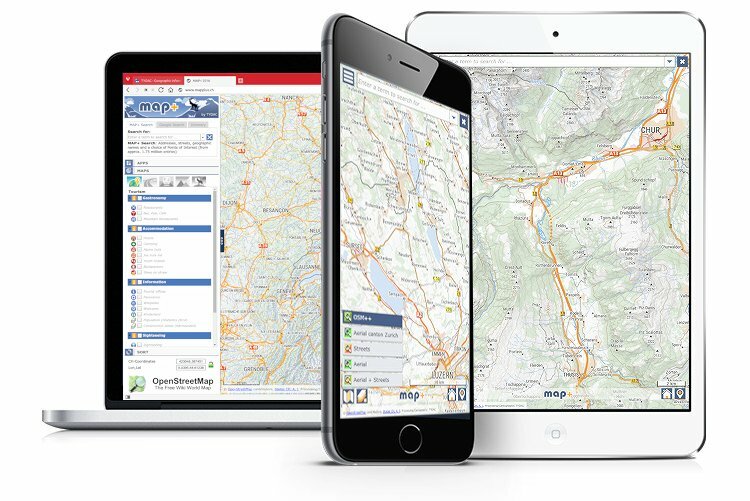 mapplus.ch is the most complete online GIS in Switzerland - now rich with OSM based maps from Montpellier to Munich, from Reims to Rimini. In addition to finding millions of objects you can display and query Points of Interest from over 100 topics or search for them. OSM++ maps are created by TYDAC based on OpenStreetMap data, enriched with free data from third parties such as the EU, cantons, and provinces. 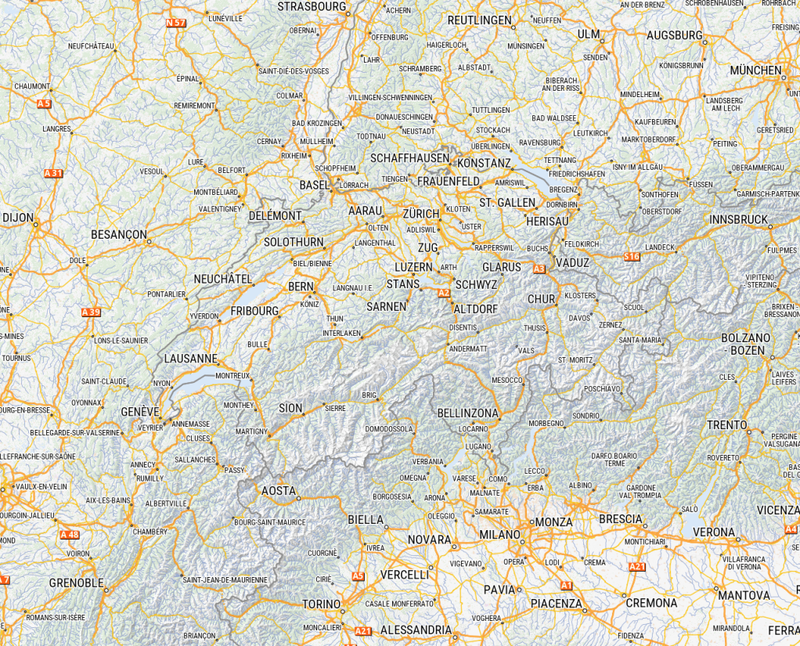 For example, we used the EU DEM and high resolution DEMs freely available from, e.g., the canton of Zurich, the Grisons, Vorarlberg, Tirol, Südtirol, and Piemont. The size of the resulting GEOTIFF file in a 5m resolution is of over 425GB! 20m contours were calculated based on this file - using GDAL of course. The coverage area was enlarged in 2016 and it reaches now from Montpellier to Munich, from Reims to Rimini. We update the data at least in a frequency of three months. 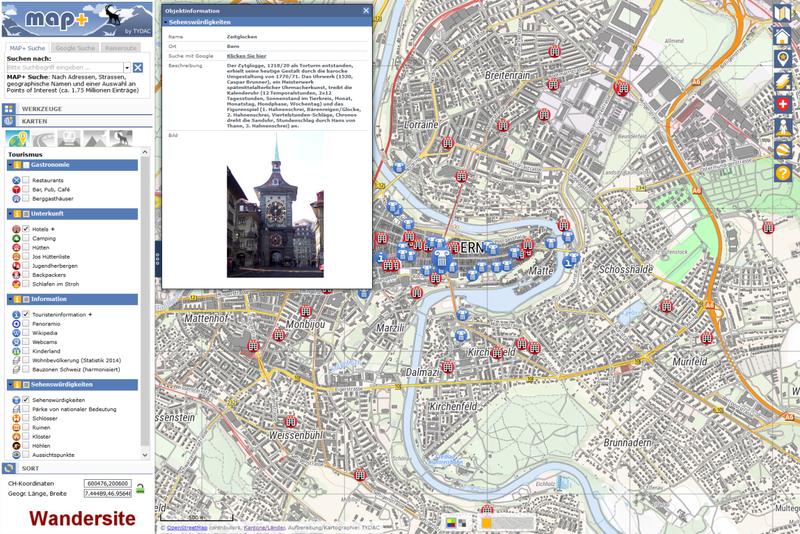 Tourism: Hotels, Castles, Tourist Offices, Camping, Youth Hostels, Webcams etc. Culture: Museums, Theaters, Sightseeing etc. Leisure and Sport: Skiing Resorts, SAC Huts, Wellness etc. Mobility: Public transport, Car Rental Locations etc. Nature: Lakes, Waterfalls, Mountain Peaks, Zoos etc. 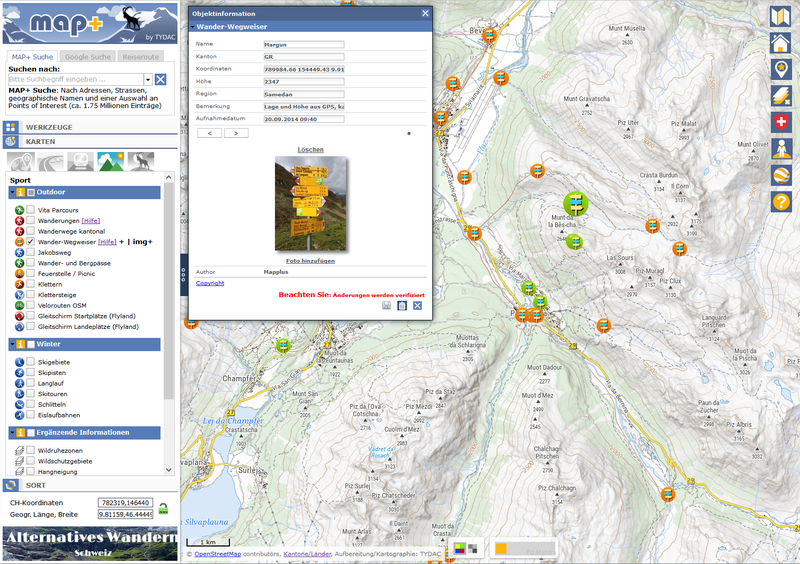 mapplus.ch automatically adoptes to the device you are using (responsive Design). Using Smartphones with an optimum in functionality and performance - looking the same as on the desktop. Of course with functionality for localization (GPS).